Dunkeld Memorial Hall has been brought back to life as a community centre. Six years in the making, with a sub-committee under the Public Lands Council forming in 2008 for the crown-held property redevelopment, just opened Sunday, 2 November 2014 to celebrate the building completion. The community wanted a facility that could accommodate a lot of people for events such as weddings, funerals, birthdays, community gatherings, concerts, and more. The only conference centre available was the local Hotel that holds 120 people. The nearby RSL was run down. To make the vision a reality, fundraising started. Willey set up a separate committee to organise the event that has contributed $100,000 to the redevelopment of Dunkeld Memorial Hall. According to a 2011 feasibility study, the new hall will create income and be self-sustaining. Following the committee going out to tender this time last year, in 2013, construction began in 2014. Hamilton architect, Jake Kelly, designed the complex and Ballarat-based Searle Brothers won the contract to build. Most of the workers onsite drive from Warrnambool, says Brown. The RSL donated the land and the building – “not in a great state,” says Brown – was demolished. It has been replaced by a hall that holds 200 people on the same land, and a room in the main complex will be dedicated to the RSL. The extended Dunkeld Memorial Hall is twice the original size, has a very large function space, with the capacity to be divided into smaller spaces, rooms for meetings, a large kitchen, offices and consulting rooms and a chapel. The first official booking will be the polling booth for the state election on 29 November. 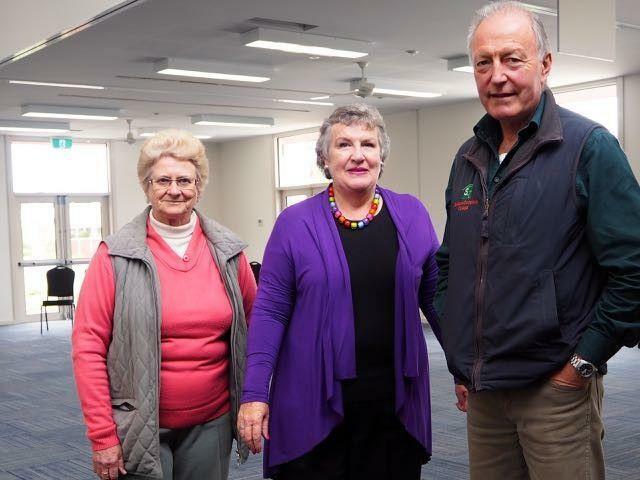 Thank you very much for the information about the terrific New Community Hall and a good photo of the three locals: Heather McIntyre, Mary-Ann Brown and George Fitzpatrick.